“Earl Norris and His Dog Team, Muldrow Glacier, Alaska,” (1947). Henry Bradford Washburn Jr.’s given name was as superfluous as his appendix. He was always “Brad” — the way Thomas Edward Patrick Brady Jr. is “Tom.” Both have loomed large in the local firmament; and with all due respect to the Patriots’ quarterback, Washburn (1910-2007) cut an even more impressive figure. “Bradford Washburn: Vintage Photographs,” which runs at Panopticon Gallery through Jan. 13, consists of 100 images. Washburn took most of them in Alaska. Several are from the Swiss and French Alps. All are in black and white. Color in wintry mountains has much to offer. But black and white has an elemental, even abstract quality. That quality wonderfully — even spectacularly — suits these settings, with their vast stretches (vertical as well as horizontal) of rock and snow. Adams is an obvious point of comparison with Washburn. Both men used a camera to capture sublimity. But for Adams there was a spiritual, even religious quality in nature that’s absent in Washburn’s work. Adams saw Yosemite as an American Jerusalem — a holy land, if not Holy Land — a place worthy of God without the presence of God. Washburn was too practical for any such view. He loved and respected nature. He didn’t revere it. Where there’s veneration in Adams’s work, there’s gusto and hands-on engagement in Washburn’s. And that engagement can be demanding, to say the least. 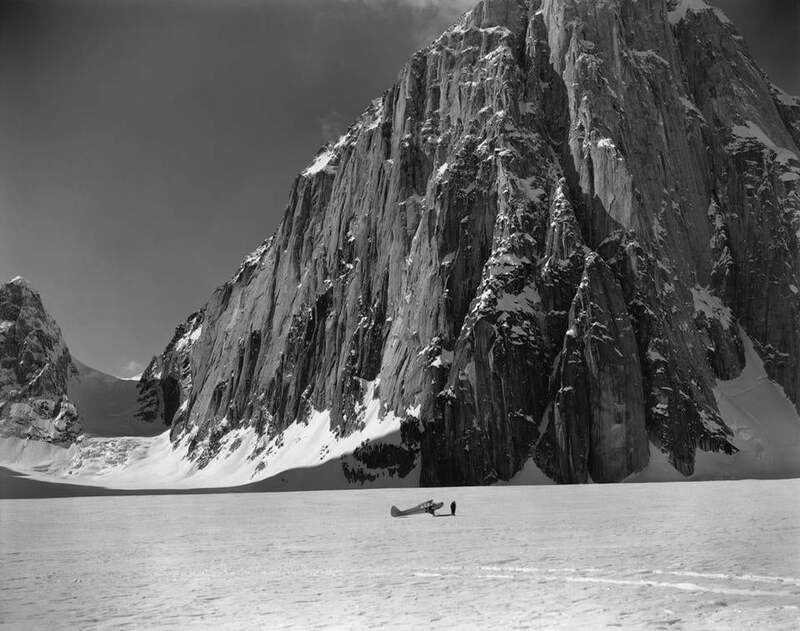 Note the near-45-degree angle of ascent in “Earl Norris and His Dog Team, Muldrow Glacier, Alaska,” from 1947. Mountains were as much for climbing and measuring as inspiring and pondering. The magnificence of nature in these images is unmistakable. No less unmistakable is their taking for granted a direct relationship between nature and man. Washburn offers heroic, pristine images of heroic, not-quite-pristine scenes. Along with all the snow and rock and impossibly pure thin air, tents or people or even aircraft will appear in these photographs. “Don Sheldon’s Super Cub Airplane at the Great Gorge of the Ruth Glacier at the Foot of the East Face of Mt. Dickey, Alaska,” from 1955, is a mouthful of a title for a pretty fabulous photograph. “Don Sheldon’s Super Cub Airplane at the Great Gorge of the Ruth Glacier at the Foot of the East Face of Mt. Dickey, Alaska” (1955). More important, that title also indicates the connection in Washburn’s work between the natural world and the world of man and his handiwork. Mountaineers, no less than mechanics, appreciate the utility of tools. Washburn knew perfectly well that he’d never have been able to get to these astonishing locations without planes and all sorts of more mundane equipment. Nor could he have photographed them without a different type of machine, a camera. Not that Washburn didn’t know which is more important, nature or man. Most of the photographs are contact prints. A few aren’t. One of them, “Mount McKinley From the Great Gorge,” from 1955, is a real behemoth: 40 inches by 50 inches. Its scale makes all the more amusing — and symbolically potent — the sight of two minuscule human figures at the bottom center. 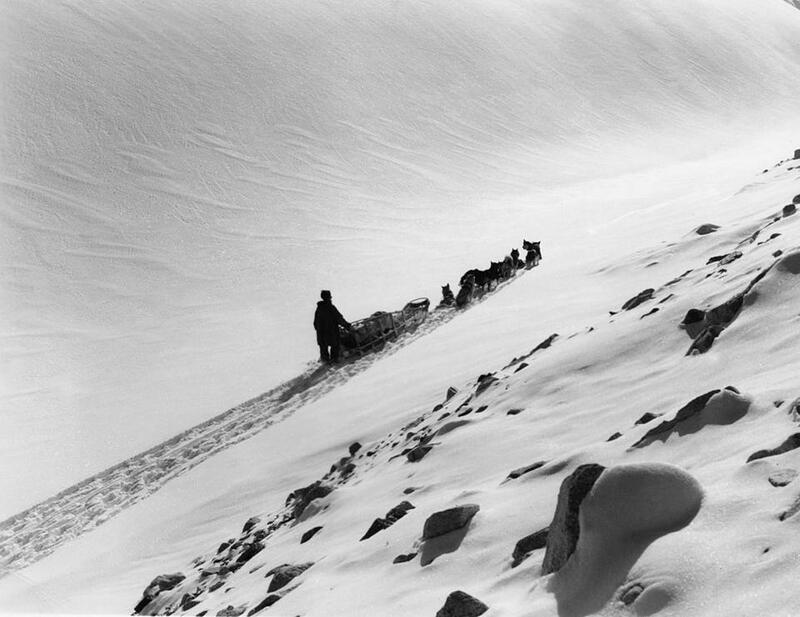 Washburn makes the same point in “After the Storm: Climbers on the Doldenhorn, Switzerland,” from 1960. The setting dwarfs the half-dozen alpinists almost ludicrously. That’s another thing that mountaineers appreciate far better than the rest of us: our essential puniness. Ivana Damien George’s “Glacial Waters” makes for a sly pendant to the Washburn show. It consists of four color photographs, 14 inches by 21 inches. Each consists of a clear globe holding water, water that came from a glacier in the Peruvian Andes. In the background, one can see the glacier. It’s at once a visual/hydrological pun and a comment on climate change. The glaciers are shrinking, which makes it easier for George to fill her bowls — until, of course, the glaciers have shrunken so much that they’re gone and so’s the water.